The Papacy lies at the heart of Catholic belief and doctrine. In this section, we’ll look at how the Papacy works and how the Pope exercises authority today. The Pope is sometimes known as the ‘Vicar of Christ’, the word Vicar coming from the Latin word for ‘Substitute’, i.e. the Pope is the visible representative of Christ on earth. 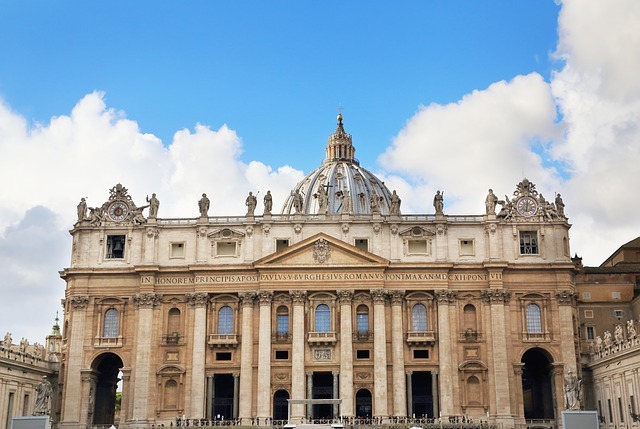 Part of the Papal function lies within the Magisterium, that is the supreme authority of the Roman Catholic Church to interpret scripture and teach it. In the section ‘The Church’ we will look at this in more detail. In the early church Rome (along with Alexandria and Antioch) was regarded as a Patriarchate, i.e. an autonomous diocese. To this group was added the patriachates of Constantinople and Jerusalem in the fifth century. This group of five was regarded as having supreme authority in the church as a whole. However, historical events (e.g. the firm tradition that Peter and Paul had been martyred in Rome) led some to regard the Bishop of Rome as First among equals, i.e. his was a primacy of honour, rather than of jurisdiction. Over time, the claims of the Bishop of Rome to be regarded as the supreme Patriarch became greater. From the beginning this was disputed, but Pope Leo I (d. 461) brought the issue to the forefront. His Tome, a vigorous defence of Orthodox Christian belief, did much to strengthen the case for papal supremacy. Portrait by Carlo Saraceni (1579-1620). The growing papal claims along with several other issues* eventually led to the ‘Great Schism’ of 1054, in which the Western church (Catholic), separated from the Eastern church (Orthodox). Further information on this is found in the Introduction to the Orthodox church. * Most notably the addition of the Filioque (Latin: ‘and the son’) to the Nicene creed, indicating that the Holy Spirit proceeds from both the Father and the Son. In 1095, Pope Urban II authorised the First Crusade, an attempt to militarily recapture the Holy Land, which at that time was under Islamic control. The Crusades continued on and off until 1272 and met with limited success. The sack of Constantinople in 1204 during the fourth crusade only served to increase the tension between Eastern and Western Christianity. In the 13th century, the church experienced a renewal movement in the monastic ideal. Pope Honorius III approved the creation of two of Catholicism’s greatest religious orders: The Dominicans (in 1216) and the Franciscans (in 1223). 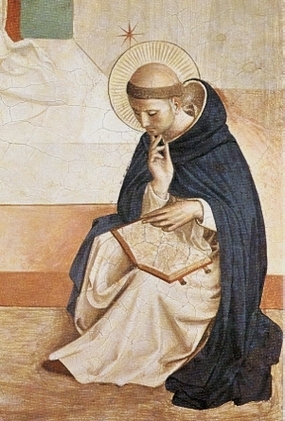 Portrait by Fra Angelico (1395-1455). In the 14th century there was a dispute between Pope Boniface VII and Philip IV of France over papal authority. The dispute led eventually to the Papal throne being moved to the French town of Avignon in 1305. This situation lasted until 1377, when at the behest of St. Catherine of Siena (1347-1380), Pope Gregory XI moved it back to Rome. Gregory’s death in 1378 resulted in a schism over two rival claimants for the Papacy – one French, the other Italian. Because of the perceived weakness of papal authority, the ‘conciliar theory’ developed i.e. the idea that the Pope was subordinate to a church council and thus the church could be governed by the consent of the college of bishops. The schism ended in 1417, when Pope Martin V was elected. Later the conciliar theory was rejected by the council of Florence (1438-45), which upheld papal supremacy. The start of the Reformation on 31 October 1517 presented a new challenge to the Papacy. The church launched its own ‘Counter-Reformation’ and Pope Paul III began the Council of Trent (1545-1563), which addressed the complaints of the Reformation leaders and clarified Catholic teaching. In 1566 the church published the definitive Catechism (‘Instruction’) which gave a clear exposition of Catholic teaching on all matters of faith and practice. This Catechism remained in use for over 400 years, until Pope John Paul II (1920-2005) published a revised version in 1992. 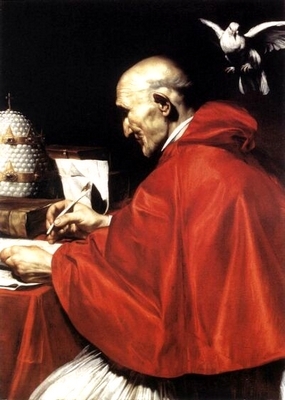 As well as exerting spiritual power, the Papacy was able to exercise temporal authority over part of Italy in what were known as the ‘Papal States’. Italy was unified by popular consent in 1870 and Papal control was restricted to Rome only. 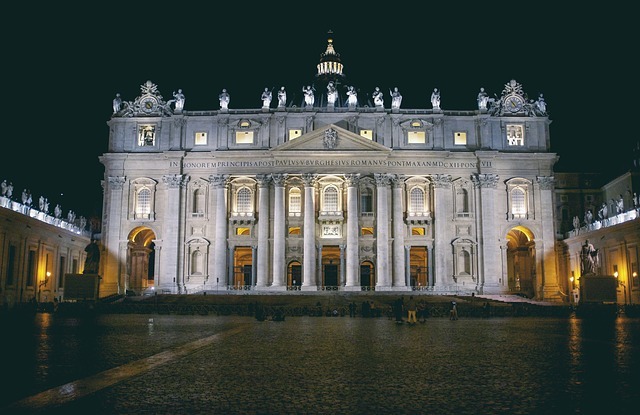 Finally, in 1929, the Lateran treaty was signed between the Italian government and the Pope. It created the Vatican City, a wholly independent state within Rome. 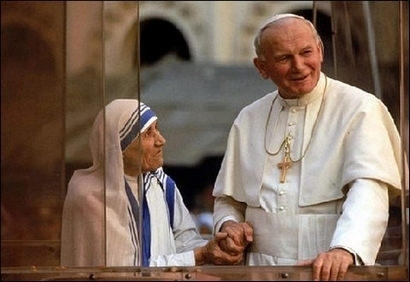 Mother Teresa of Calcutta (1910-1997) and John Paul II (1920-2005). This was first proclaimed in 1870 as a dogma (i.e. a divinely revealed truth), though the view itself was held by some before that. This declaration does not imply that the Pope is without sin, but rather that any pronouncements he makes on faith and morals and made ex cathedra, that is from his position as leader of the church, are divinely revealed and binding on all Catholics. In 1950, Papal infallibility was used to proclaim the Catholic belief in Mary’s assumption into heaven. Furthermore, the declaration is retrospective i.e. previous Papal pronouncements may be regarded as infallible if they meet the criteria specified above. Thus the 1854 declaration of the Immaculate Conception of Mary is accepted in this manner. The Papal Coat of Arms of John Paul II (1920-2005). On 13 March 2013, Jorge Mario Bergoglio was elected Pope, replacing Benedict XVI (see below). Aged 76, he was born in Buenos Aires on December 17, 1936, one of five children of an Italian immigrant railway worker. He entered the Society of Jesus in 1958. He was the provincial for Argentina from 1973 to 1979. He was ordained a priest in 1969 and a bishop in 1992, and was made a cardinal in 2001. He is the first Jesuit ever to be pope and the first non-European pope since Pope Gregory III (AD 731-741). He is the first pope from the Americas, and the first pope from the southern hemisphere. 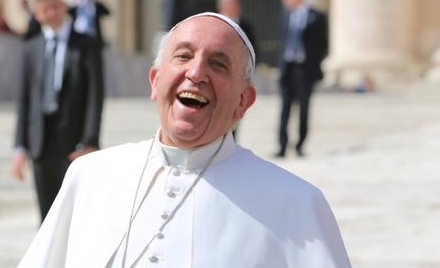 He is the first pope to introduce a new single papal name in over 1,000 years. In 2001 he visited a hospice to kiss and wash the feet of 12 AIDS patients. On 19 April 2005, Cardinal Joseph Ratzinger was elected the 265th Pope of the Roman Catholic Church. He took the title Benedict XVI (The word means ‘Blessed’). Joseph Alois Ratzinger was born in Bavaria, Germany on 16 April 1927. Ordained a priest in 1951, he later become a professor at several German universities. He gained a reputation as a prolific writer and eminent theologian and attended the second Vatican council (1962-5) as a peritus or theological adviser. In 1981 he was appointed to the prefecture of the ‘Congregation for the Doctrine of the Faith’, a department within the Catholic church dealing with doctrine and church discipline. His inaugural mass as Pope was celebrated on 24 April 2005 and early in 2006, his first encyclical: Deus caritas est (God is love) was published. 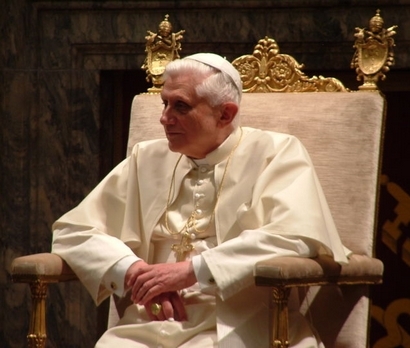 On 11th February 2013, Benedict XVI announced his decision to step down from the papacy, effective from 28th February. Pope Benedict’s decision made him the first Pope to resign since Pope Gregory XII in 1415. 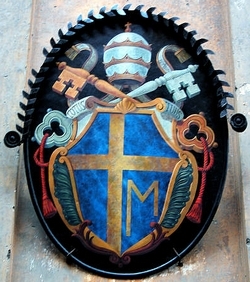 The crest above consists of the crossed keys of Saint Peter with the papal tiara above. St. Peter, by Albrecht Durer (1471-1528).